As yet another Mother’s day is upon us, I am reminded that even Hallmark Holidays can be a moment to reflect gratitude. In our house, we probably don’t celebrate in a traditional mother’s day manner. What I mean by that is, it isn’t a day for me, “the mom” to be freed from the overburden of household work, or be given a spa day where I don’t have to interact with any of my family members, or to be lavished with gifts as a way to make up for lack of thanks or appreciation the other 364 days. Some moms like to spend mother’s day in these ways and some of families do need to better acknowledge the contributions of their mom(s). On Mother’s day, I find myself immersed in my family’s ordinary life – something I love! We might go out to breakfast or dinner, when we wouldn’t ordinarily do that. But it won’t be extravagant or fancy. We will still do yard work, hang out together, probably watch a sporting event and I’ll receive a few small gifts. Like most moms, I appreciate my children’s school-made gifts best. 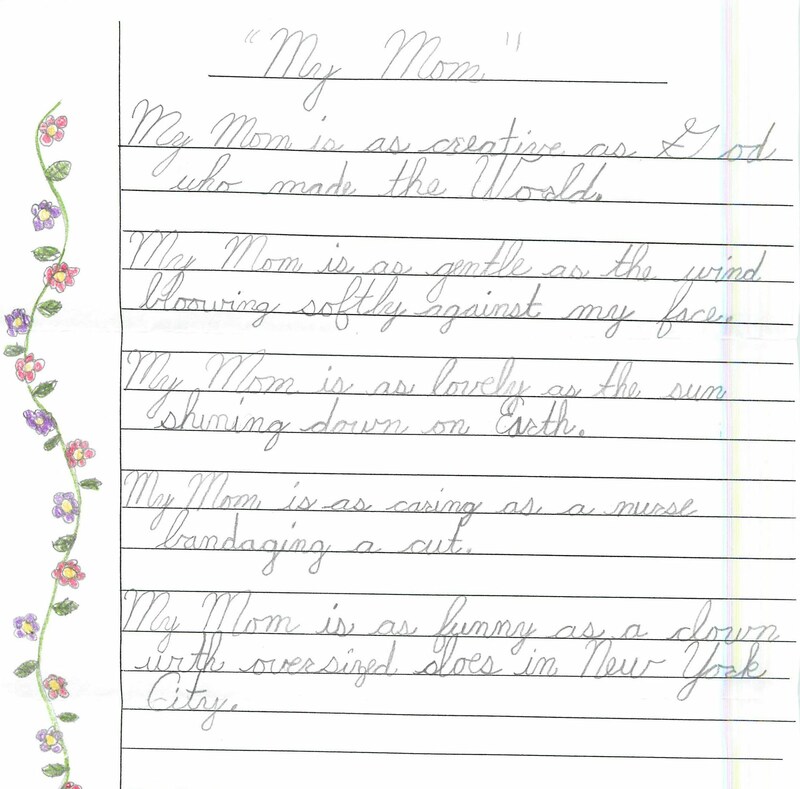 Last year’s poem is an example: “My Mom” – My Mom is as creative as God who made the World. My Mom is as gentle as the wind blowing softly against my face. My Mom is as lovely as the sun shining down on earth. My Mom is as caring as a nurse bandaging a cut. My Mom is as funny as a clown with oversized shoes in New York City. 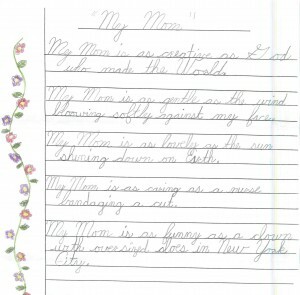 I especially like the first line of the Mother’s Day 2012 poem – My Mom is as creative as God who made the World. For most children, their experience with their parent is how they first come to imagine and know God. I am thankful that my children see God both as creative and that God could be a mom (not just a dad). I also want them to learn through experience that “God as our parent” is a model of an ever present and loving relationship. I think the reason Mother’s day is not EXTRA-ordinary in our house is because my family has been able to cultivate an attitude of thanks and acknowledgement throughout the year. We talk about how each of us has special gifts to give the family and different responsibilities. For example, the kids often thank my husband or I for their meals. But on busy mornings, one of them will often get downstairs early and start breakfast for everyone. In fact, most of the household chores are divided up according to skills, not gender or age. When we do laundry everyone has to sort colors and whites. There is no one designated as the person who takes the baskets to the laundry room; it’s a team effort. While my husband and I switch off changing loads and making sure things move from the washer to the dryer; my oldest daughter will pitch in if one of us is busy. The kids aren’t yet skilled enough to fold most clothes, but they are the official sock sorters and folders! Dividing up the work shares the responsibility, as well as helps everyone feel invested in the household. This seems like a leap from “God as parent.” I don’t see it that way. Substitute God for the mom or dad role in this story . . . God as ever present, laboring with us, and co-creating the world, our relationships, and even keeping our house running are ways I hope my children learn to see God in the world. I am not saying everything works out great and things are always idyllic. Rather, I want to note that my experience on Mother’s Day does not match the running joke that “Mother’s day is a break for mom from the family, while Father’s day is a day for dad to be with the family.” I am grateful to my family that I feel valued, appreciated, and loved everyday of the year. I also recognize this may be true because we work hard as a family to make sure every member feels that way, too!